This is Tape Number 004 of the Paul Herbert Collection. Posted in Consciousness, Culture, Death, DMT, Erik Davis, Evolution, Extraterrestial, Future, Imagination, Psychedelics, Religion, Science & Technology, Terence McKenna (mp3). to stop the frenzy the feeding the pleading! Are you suggesting that the “2nd book” that is referred to at the beginning of the talk may have been an early edition (or something like this) of ‘True Hallucinations?’ He seems to refer to it as ‘Down to Earth: Psilocybin & UFOs.’ I had a funny thought that perhaps he was talking about ‘Psilocybin: Magic Mushroom Grower’s Guide,’ but didn’t want to give away the real title, since it had been written pseudonymously, and it was probably only known in limited circles that he had written it. It certainly contains an introduction connecting the mushroom to the UFO. If there is some other book out there that was published by McKenna at this point, I would love to find it. [COMMENT by Lorenzo: That’s an interesting thought about Terence’s first two books, and I think you may be correct. 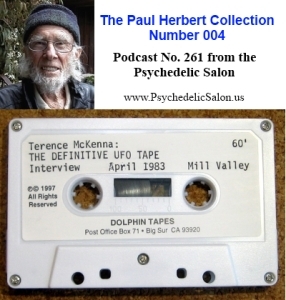 As you will hear in podcast 267 and others, Terence eventually admitted to authroring “Psilocybin: Magic Mushroom Grower’s Guide” with his brother Dennis. Their pen names for that book were O.T. Oss & O.N. Oeric. The copy I have is the revised edition from 1986, but I see that the current edition was published in 1993. Originally it was published in 1976, and my guess is that the UFO material you mention was only in the first edition, because I don’t see it in the newer one. … Maybe it’ll turn up on the Web one day. Listened to this tape for a second time yesterday, I really love when he talks about “next steps”: that we’re not ready for a science yet, but what we need is journals and travel diaries from explorers; that the best approach would be to give intelligent people drugs with no expectations, just let them try and figure out the whole experience and share their thoughts and experiences with others (or words to that effect, I’m paraphrasing here). I’m pretty sure the female voice is Faustin Bray. Interesting that Terrence is very specific regarding the “transformation of man into a space faring race on a biological scale being the great even that history is about”. It seems he became less sure of this escape into outer space in his later years, hinting that space travel may mean escaping into the imagination or “inner-space”. As someone who works in the space industry and has a keen interest in the psychedelic experience, I hope it is both! This is an absolute gem! A wonderful discussion of profound ideas that Terence also highlights be reading enigmatic poems by Yeates. In 1982 Terence had already been working on the manuscript for what eventually became True Hallucinations. It was around 1983 that Terence collaborated with Faustin Bray and Brian Wallace of Sound Photosynthesis to record this manuscript. The entire theme of the original True Hallucinations – which is archived as an incredible 9 hour audiobook that is complete with original music and sound effects – was UFOs. The first sentence in the original version is “At the present moment the UFO is a complete mystery”. The last words are “humanity and the UFO are one”. The book Terence references in this 1982 lecture is undoubtedly True Hallucinations – which includes the missing chapters in the Sound Photosynthesis audiobook. I just got this on CD. It as an absolute must-listen for McKenna enthusiasts! Thanks Lorenzo. Great work. 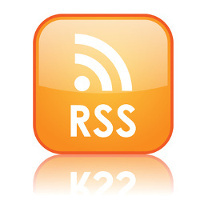 I am donating $100 for The Brotherhood of the Screaming Abyss by Dennis McKenna. We are what’s going on and we know how to do it. Money, government and territoriality are obsolete. because it is continuously becoming more of itself. The cosmos cycles through in a continuous way. Cycling through at continuously infinite speed. Material and immaterial are the ultimate balance. knowing where you are going or what’s going on. Also, forgot to thank you for putting the link to Dennis’ Kickstarter Project up, definitely pledged for that. For those new to Kickstarter, I recommend checking it out! Thanks for the another podcast, Lorenzo! I’ve only recently discovered the Salon, and over the last 2 months have been making my way through the archives (Taking a break to listen to The Genesis Generation, great novel!). 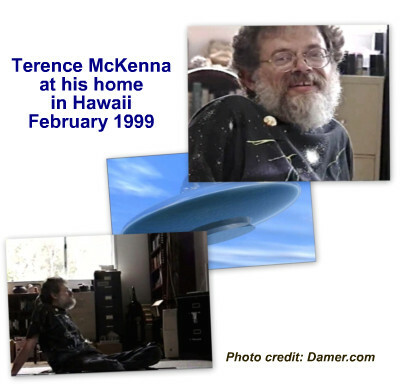 This McKenna talk will join me on a short road trip tomorrow, looking forward to torturing my passenger with it! Is that Kat for sure? The gulping water thing always just made me want to drink some water. Some folks are a bit more fragile I guess. 😉 That was funny! @ feedbackart – You make some great points. Although I’m nearly certain that is not Kat in the background…different voice…and she was more in agreement with Terence than the interviewer in this talk is. No matter how much we seem to think we have a grasp on the so-called “real” world, all that we perceive is the simple accumulation of thousands of generations of built-up, primitive visual language. We can not see more than the human race has seen, EXCEPT under the influence of psychedelics (or similar mind state) or in the presence of the “other” – what has been called, the “UFO”. I am curious: What “legitimate video footage” are you referring to? How was it *legitimized*? Who legitimized it? And how was THAT person qualified to do such a thing? Are they at Harvard or UCLA or Cambridge? Are they physicists who publish regularly in scientific journals? Videos fiction is becoming more “real” looking than reality these days. There are some incredibly well-done fakes out there. And the ability to use CG is expanding exponentially with improved technology. Also, I tend to feel that Terence’s theory is simply *confirmed* by the fact that some people have multiple experiences. It is only my opinion, but logically, that would say more about the multi-contactee (about their ability to see the “other”) than it does the phenomenon of UFO sightings, as conventionally portrayed. I’m not saying they aren’t seeing incredible, even supernatural events, I just don’t think that they are flying craft from some other world out in space. Just my opinion. At least in Terence’s talks, he explains pretty clearly that these encounters may be much MORE strange than the traditional notion of UFO’s. It is simply that the meme of “UFO” is so ingrained in popular culture that the mind of the observer of these events has no choice but to map that more conventional notion OVER what is actually occurring. Recall that the Caribbean Indians when faced with Spanish ships for the first time were unable to actually SEE these invaders anchored out off their coast. They had never been exposed to such phenomenal objects. Yes, they saw a vague image of “something” and there were definitely ripples in the water. But it took a shaman to walk out on the beach to see and then relate what was really going on. Then, *suddenly* the whole tribe could see that these were in fact large sailing vessels, with men aboard. We only have what we already know, to create an explanation for new things out of. And I agree with you that Terence was likely not 100% correct (which he never claimed anyway). But, he was on to something with the theory that there IS an “other” tenant in building, and that we are slowly waking up to exactly who/what that “other” is. I was going to suggest that the unidentified female voice belongs to Laura Lee of the Laura Lee Show but the previous commenter seems more authoritative. The voice from most of the questions at the beginning sounds like Terence’s wife Kat. (They must have had a great babysitter) She makes some very valid points to raise the awareness of the listener: things which Terence for one reason or another leaves out of his monologues/answers. Great complements between the two, for a great talk. Also the sound quality from the oldest archived record of Terence on the PsySalon is great! Terence must’ve pulled the microphone to the side of his chin or throat when drinking water, and you can hear much of that during the other public speaking engagements on the Salon. Funny comment in the letter you described at the beginning. :-) They’d have a hard time in a vine ceremony with all the other body noises for sure,,, all night! The “pay attention” and “do not give way to astonishment” phenomena within the DMT space and the alarm dictated by the quick transition leads me to think that Terence had not had too much experience with it by this stage in 1982 because he keeps referring to the sight of the spinning discs as the point at which rational mind breaks down and there is no explanation for what is being viewed/experienced. Thus the interception from either the future of mankind or a rational explanation being given for the other worldly contact being established within the Psilocybe space, “to the degree that you can decondition yourself from the history-bound cognitive systems that have carried you to that point.” I believe this theory breaks down when one has had multiple encounters with the physical unidentified flying object and when viewed completely sober and still within the rational mind. What does that say about legitimate video footage seen by thousands if not more who did not witness it first hand? I think it has to do with a choice of what to believe, and when the person confronts that choice, rather than the point at which the rational mind break down. We would have tons of faithful religious folks who had all seen a UFO just because of their devotion to the irrational, if Terence were 100% correct.